On May 2 2005, when my husband woke up from surgery after his motorcycle accident and heard the words “spinal cord injury” and “paralyzed” one of his first thoughts was, I am going to walk again and that remained a theme throughout his rehab. He thought if I just work hard enough, if I just keep trying, I will walk again. If you walk through the halls of any rehab center today you would probably hear the same mantra from the majority of patients. No one wants to accept the reality that they will experience the rest of their life from a wheelchair, but that is the reality for millions of Americans. Congress has recently acknowledged September as National Spinal Cord Injury awareness month. According to an article published by paralyzed veterans of America the goal is to bring awareness to health care and treatment of individuals with spinal cord injuries. There are millions in the United States who have experienced a spinal cord injury but despite the numbers research and funding is still lacking for researchers to find a cure. Let’s take a look at some other numbers, according to the Center for Disease Control and Prevention (CDC) adults with disabilities are three times more likely to have heart disease, stroke, diabetes or cancer than those without. We know that regular physical activity can help decrease this percentage yet only 44% of adults with a disability who went to the doctor in the last year were given physical activity recommendations. However, 82% of adults with a disability said they would be more likely to be physically active if their doctor recommended it. Maybe there’s a reason to bring awareness to spinal cord injury health care beyond finding a cure. There is a medical and social model of disability. The medical model sees disability as a problem to be cured, something that needs to be fixed. If an individual who uses a wheelchair came upon a flight of stairs the medical model would view the reason the individual is using the chair as the problem. Fix the problem by finding a cure for their disability. On the other hand is the social model of disability. In that same scenario this model would say that society is the problem by creating a world that is inaccessible. Had they used a ramp instead of stairs there would be no barrier and therefore no problem for the individual with a disability. While finding a cure for spinal cord injury is certainly a noble and necessary task if more people accepted the social model of disability those living with a spinal cord injury would be able to live a more active fulfilling life. For example, using the statistics previously mentioned if doctors started to view the individual and not just their disability when they were seeing patients and started prescribing physical activity, not only would it start to cut back on the secondary conditions associated with a sedentary lifestyle it would also provide more independence for those individuals. For example, imagine if an individual who uses a wheelchair lost 30 pounds. This could mean the difference between being able to transfer independently or not. Transferring independently means they can now drive a car, live without a caretaker, go for a handcycle ride with their kids and so much more. Not to mention that all of those things help that individual be more physically active which just reinforces that circle of change and decreases their health risk even more. 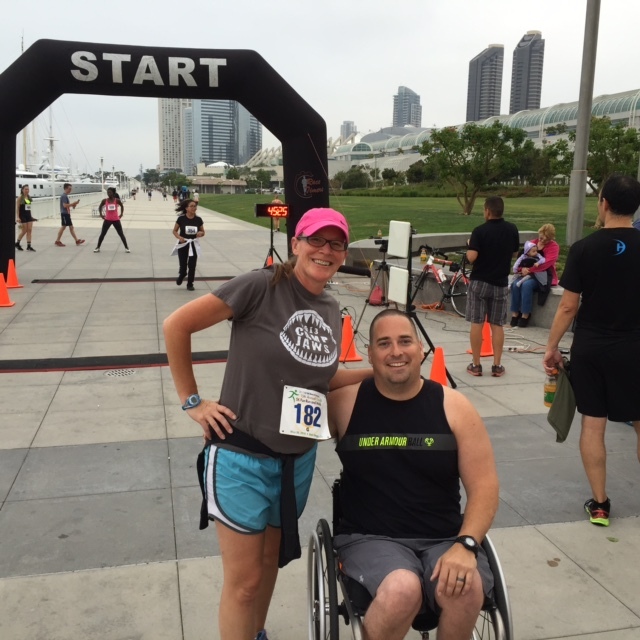 Ten years later trying to walk again is no longer my husband’s battle cry. He has moved on and accepted the life God has given him. Would it be nice if he could stand up or walk again- absolutely but it’s not his focus. Right now his goals are to stay active and healthy so that he will not only be around to watch our little girl grow up but to be able to play with her, ride bikes together, and be everything that every other daddy is to their little girl. He will just be doing it sitting down. So let’s have a national spinal cord injury awareness month, but let’s use the social model and bring awareness to everyone. Yes, continue the research to find a cure, but let’s also bring awareness to the developers of the playground down the street from our house so they make it accessible so that my husband can actually take our daughter to the park, and let the restaurant owner know that we would eat at their cute little locally owned and operated restaurant but my husband can’t get in their inaccessible bathrooms and tell my doctor’s office that after 9 months of appointments they should know that their rooms or exam tables are not accessible and finally tell the individuals who keep parking in the stripped area next to an accessible parking spot that those aren’t parking spots and that my husband actually needs that area to be able to get his chair out of the car. Because if we bring awareness and change to all of those things than my husbands’ spinal cord injury becomes just one of his many characteristics and not the leading role. The biggest issues are still employment and education. There was a time when this was a priority. It so needs to be again.